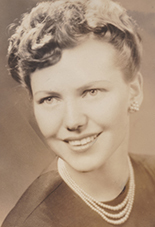 Eleanor ”Elle” Hooson (née Goodwin) died peacefully at Hollyburn House, West Vancouver, on January 19, 2015, at the age of 94. Eleanor was predeceased in 2001 by her loving husband of 55 years, Bill. She is survived by daughter Jan Constantinescu; son Paul Hooson (Jude Neale); grandchildren Mark Messcu (Katy), Lora Genaille (Darryl), Jeremy Neale, Katie Neale (Geoff Tintinger); and great-grandchildren, William and Eva Messcu. A graduate RN from Vancouver General Hospital and Public Health Nurse from UBC 1944-45, Eleanor worked for the provincial government clinic at Vancouver General Hospital (VGH). She was a member of the VGH School of Nursing Alumni Association, the UBC Public Health Alumni, and the International Philanthropic Educational Organization Sisterhood. Eleanor and Bill lived in Victoria for 25 years, followed by Kingston (Queens University), and Whistler, before retiring to West Vancouver in 1984. Eleanor was devoted to her deeply cherished family and to her many treasured friends. In memory of Eleanor, donations may be made to the Therapeutic Clown Program, BC Children’s Hospital Foundation.